If you’re looking for a vehicle that can seat up to five people (including your chauffeur) and has space for up to three medium pieces of luggage, the Mercedes S Class hire car could be the perfect vehicle for you. With our chauffeur hire service, you’ll never have to worry about the condition of your vehicle. Our job is to ensure that the only thing you have to worry about is enjoying the ride. This classy vehicle features two-zone climate control which guarantees everyone on the trip will be comfortable since the cabin can provide two different temperatures based on preference. The front and back centre armrests give a touch of extra relaxation, and the power windows offer additional control to all passengers. The featured leather seats provide extra elegance and luxury while ensuring that you’re able to relax on your drive. Some models feature an electric sunroof for an outdoor experience, and the air electronic suspension offers a sporty, effortless feeling while navigating. Ambient lights can create the perfect mood for your journey, along with the added comfort of spacious seating in the front and back. 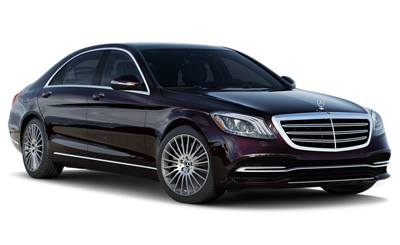 Let our Mercedes chauffeurs get you from A to B with our premium Mercedes S Class hire car services today.